Yardley Bagel Café joins the local community - Times Publishing Newspapers, Inc.
With indoor seating for 30, free WiFi, charging stations, TV and music, its not your average bagel shop. Owners Dan and Kathleen Laurie wanted it to be about more than just bagels when they designed the space, which includes a full restaurant kitchen allowing a varied menu offering. Full breakfast offerings include gourmet omelets, French toast, eggs, scrambles, breakfast burritos, and more in addition to the standard bagel sandwiches. For lunch, the menu offers a wide variety of salads including roasted beet salad with baby spinach and arugula, goat cheese, pistachios and honey dijon vinaigrette and their chicken apple walnut salad with baby greens, grilled chicken, apples, walnuts and blue cheese crumble. Along with the salads, you can also get gourmet deli sandwiches including roast beef, pastrami, ham, and a mouth-watering cheesesteak. The gourmet coffee and espresso bar is an added treat to go with your breakfast. Their bagels are New York style kettle boiled, baked fresh onsite every day, and go great with the homemade style in-house blended cream cheese flavors. Dan and Kathleen met each other in California and lived there for many years while working for a major pharmaceutical company. Dan was in the supply chain side of the business and Kathleen was involved in engineering and the technical end. Both the Newtown and Yardley locations have a unique logo that people often wonder about, depicting a plane carrying an oversized bagel behind it. Dan has been a pilot for 30 years, having learned in California when he and Kathleen lived there. In fact, their first date was a flight to the Sierra Mountains. Throughout the years, he worked on all of his advanced ratings and became an instructor. In 2012, Dan decided to leave the corporate world and pursue his passion of flying and business ownership. In addition to managing the two stores, Dan is currently a corporate pilot flying for a large international corporation. In 2013, Dan and Kathleen bought Newtown Bagel Company and Dan spent the next five years learning and growing the business prior to opening Yardley Bagel Café. 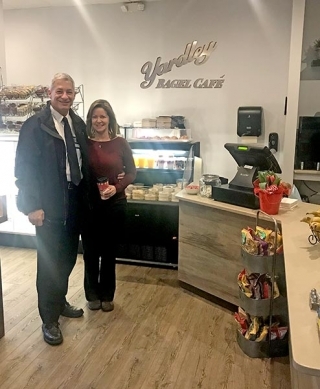 Dan and Kathleen are 20-year residents of Yardley and when the current space became available it made sense to take what the couple learned at Newtown Bagel and try to improve on it. The atmosphere at Yardley Bagel Café is warm and welcoming with a cozy feel – plenty of booths, local artwork and photography decorating the walls and one wall covered in brick all give it a trendy and unique style. “We’re very proud of Yardley Bagel Café and what we have created,” Kathleen said. “We want everyone in Yardley to know we are here and to give us a try,” said Dan. Yardley Bagel Café is located at 670 Stony Hill Road, Yardley. They are open Monday to Friday from 6:00am until 2:00pm and Saturday and Sunday from 6:30am until 2:00pm. See more of their offerings at www.yardleybagel.com, contact them at 267-573-4717, or stop in today and check out the delicious meals and warm atmosphere they offer. PHOTO CAP: Dan and Kathleen Laurie in their shop.